Flip a coin. 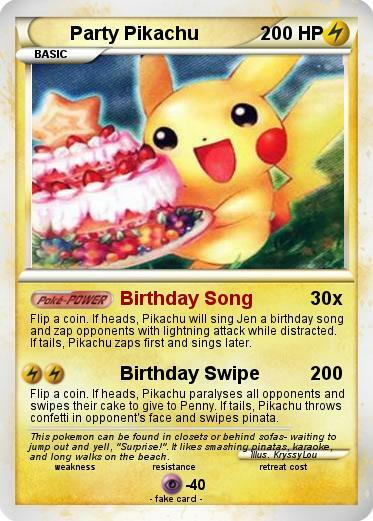 If heads, Pikachu will sing Jen a birthday song and zap opponents with lightning attack while distracted. If tails, Pikachu zaps first and sings later. Flip a coin. If heads, Pikachu paralyses all opponents and swipes their cake to give to Penny. If tails, Pikachu throws confetti in opponent's face and swipes pinata. Comments : This pokemon can be found in closets or behind sofas- waiting to jump out and yell, "Surprise!". It likes smashing pinatas, karaoke, and long walks on the beach. Minion Party | doge party | Carnaval party | Party brainz | Mario Party | Birthday pikachu | pikachu party | Party Pikachu | Civilized Pikachu | Pikachu party ex | Pikachu freddy EX | KrawuschΠkachu | Birthday Pikachu | cool fun for pikachu | _________'s pikachu | Christmas Pikachu | Party Pikachu | Ipod Pikachu | party rock | Party Cat 2 | Party . Ex | Party mark | Party Pea | club penguin | lmfao | Party pewds rare | Party Brainz | Happy Birthday | baby party | Angry Bird Party | mario party | lmfao party bot | Party rock | Chandelure PARTY | PARTY ROCK 999 | PARTY baby | Party Bear | party freak | TIME LORD PARTY | Party Penguin | mario party 10 | Party Brock | Andrew's party | Party Anime Girl | Anime Neko Party | Party pete | FNAF PARTY EX | Space Party Whale | rainbow party | Trainer Dale | Theodore Roosevelt | party spell | party faruk | pinkie pie | Pinkie Pie | party 100000000000000000 | all sonic fun | Mario Party 9 | POKE PARTY | boracay | Mario party | Pinkie Pie | pinkie pie | Pinkie Pie | Pinkie Pie | The US Today | hannah | Pinkie Pie | Fat Waddles | its time to PARTY!